I chanced upon the booth that was selling nanoblocks and I decided to pick one up. The Sanrio ones were flying off the shelves, and by the time I got to the booth about five minutes after the show opened on the first day, the Hello Kitty one was sold out! I decided to pre-order the Hello Kitty Set. Would take about 2 weeks to arrive, which was ok with me since I'm pretty busy these days I might not lay my hands on building the figurine immediately. 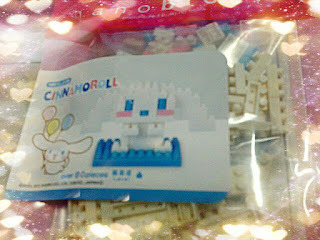 Nanoblocks are pretty popular these days and are often sold at Kinokuniya. The designs vary from time to time, and in what I understand the Sanrio series is considered a Japan exclusive. Hence, it was a pleasant surprise to see it at the comic con! They are somewhat like lego blocks, but so much tinier. An average piece is only about 6-7mm! They're so minute that I think I've to use tweezers to piece the parts together. Hoping to get onto building my Cinnamon Roll soon! Shall blog more about it when I finish the complete figure.